The more solid the construction, the longer the life and the better the data will be. Dyne Chassis Flex will cause all sorts of odd data records. Some of the oddest dyno readings seen can be explained by dyno flex and twist. A Suzuki Hayabusa 1300cc will flex itself before it distorts the EC997 front wheel chock! Extremely sturdy construction. Uses minimum 3/8" plate steel on walking surfaces. Uses heavy duty structural channel steel for roller / brake framework and the majority of plate fasteners are 1/2" allens. "Diamond Plate" design is an excellent surface for areas that are likely to experience periodic liquid spills. Diamond Plate is used around the drive roller for safety. "Grip Tape" is used in footrest areas. Sustained oil and antifreeze contact will damage tape. Tape is replaceable as required. Even though the EC997 is constructed of plate steel rather than sheet metal, overall dyne weight is similar to dynojet, as the low inertia drive roller (pat pend) weighs much less than the high inertia drum and allows beefing up of the dyne chassis. Sturdy construction of dyne chassis. Has smooth walking surface but with "grip tape". Tape is replaceable as required. Construction the dyne chassis is of very high quality, but end user "ease of use" is not as highly developed as the construction. Extremely lightweight dyno chassis is cleverly constructed mostly of bent sheet steel and covered with thin, lightweight diamond plate aluminum on current models, providing just enough strength for use. The overwhelming amount of weight present in the complete 100, 150, 200 series dynes comes from the high inertia drive roller or drum. The mechanical heart of the dyne system. Brake size must be matched to intended use. The better the size match, the quicker the response time and the better the reliability and longevity. Using a 500hp brake is a poor application for 25hp to 150hp test applications. Kind of like using an aircraft carrier to go bass fishing. The point? Use a responsive, high resolution. dyne system, matched to your use to get the most out of your work. Very quick reacting to load changes. Excellent in step and sweep tests. Small diameter, low inertia eddy current brake assembly with a system Linear Mass Rating tm of less than 300# (as compared to 345# or 450#). Uses system similar to Mustang dyne's patented Virtual Inertia System - works best with low inertia dynes. When testing, a "brake" converts power to heat, which must be removed from the brake assembly or the brake will overheat and fail. Air cooled eddy current brakes must be spinning at a high enough rpm to generate enough air circulation to dissipate the heat created while creating load. Slower to react to load changes, large diameter, high inertia eddy current brakes are not an optimal application for step or sweep tests. Cannot use quick acting, small diameter brake because it has a 20" drive roller, turning at too low an rpm while testing - not fast enough to generate enough cooling air to dissipate the heat created in the eddy current brake assembly - causing premature brake failure. According to Superflow, their eddy current dyno drive roller has a Linear Mass Rating tm of 280# plus the large diameter EC brake has a rating of 65# for a total of 345# or 157kg. Especially a problem with high torque / low speed vehicles, such as HD and Buell, so they must use an overly large brake, with more radiant area, but poor cooling to avoid brake burnout. Large diameter, high inertia, heavy 379lb eddy current retarder assembly. eddy current retarder, coupled with the extremely high mass of even the ~900 lb. standard drive roller, reacts even slower to changing power requirements. Poor application for step tests and the poorest of all in rapid load change response requirements. Cannot use quick, small diameter brake because it has a 18" drive roller, turning at an inefficient rpm for the vehicle speed - not fast enough to generate enough cooling air in a smaller diameter brake to dissipate the heat created in absorbing the vehicle power. Especially hampered by an extremely heavy ~800lb-900lb drive roller, which, when coupled with the 379lb retarder causes dramatically increased engine wear when performing step tests. Dynojet had the same problem as Superflow when attempting to use a copy of our small diameter eddy current brake- burnout due to poor cooling due to low rpm caused by the low rpm of the brake. Dynojet still has a problem with brake overheating, as the software will shut down dyno operation when the brake reaches an incredibly high 900f!! (according to K.L. at dynojet). The soul of the dyne system. Very quick reacting to load changes. Excellent in step and sweep tests. This is due to extremely high data transfer rates for speed and load control coupled to the lowest system total inertia. The bikes that require special settings are low torque / low speed applications, such as cbr250. These bikes require the Small Bike control setting in the software. Software control data rates are sufficient, according to Superflow, but it's observed that high torque, low speed vehicles seem to be difficult to control. Insufficient control system makes it impossible to control the load as well as the EC997 series, causing excess engine wear due to heat buildup - the result of the dyne taking too long to stabilize at a particular rpm point (as in fuel injection mapping. Dynojet simply cannot control load properly on Buells and TZ250's as seen at Sears Point AMA National. The Buell was randomly lugged to almost stall, then unloaded to extremely high rpm then dragged down to almost stalling again - over and over again - without ant real control. And the bike, which ran without missing on the dynojet dyno, still missed on the track! Dynojet knows that, despite their marketing claims, they cannot control the load even close to as as well as the EC997 or the Superflow dynos. You can't combine a heavy drive roller, limited speed sampling, low roller rpm and a very large diameter eddy current brake operating at the lower end of it's operating range and expect to have decent load control! Sorry. 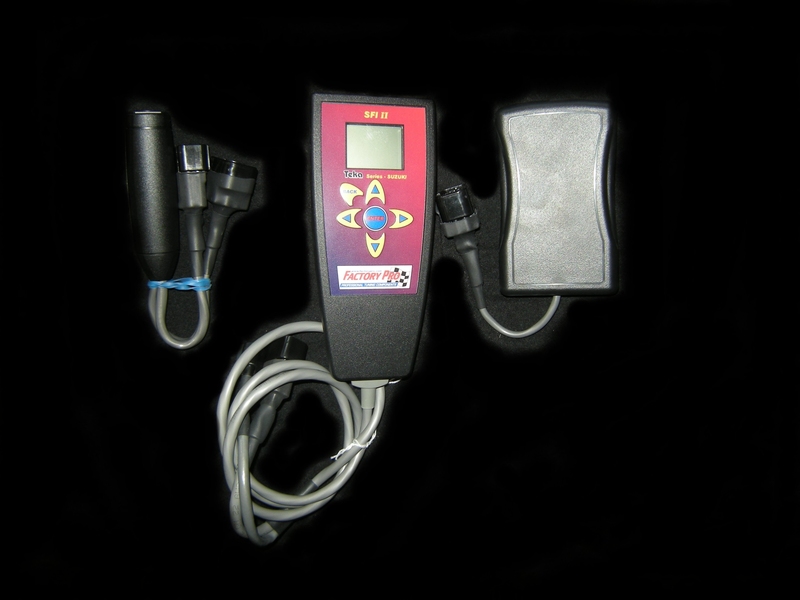 Dyno Calibration Software is specially designed to be user friendly. Easy to calibrate, with step by step instructions built into every EC997 Software Package. 2. Place calibration weight on the torque arm. 5. Click "Save and return to test"
Simple. Do it every month or so. We build dynamometers that will be useable 50 years from now. Calibratible by user. Power readings are consistent between different Superflow dynos, as long as the dyno is set up to display the True HP figures. In the Superflow software, there is the ability to modify the True numbers, after they are recorded. 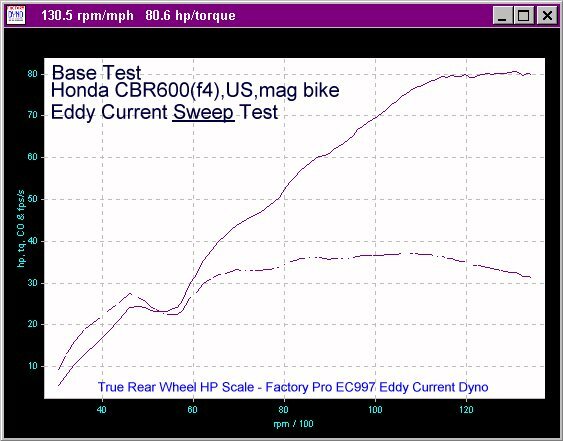 Unfortunately, you can't tell if the dyno owner is using modified or True HP figures. As your roller surface wears, the bearings wear and develop friction and the knurled drum surface gets worn smooth causing less air drag the calibration needs to be updated to current dyno conditions. That partially explains why it's not usual to be able to expect any closer than +/- 5% to 7% consistency between different dynojet dynos. Look at Cycle Canada's and Roadracing World research on that. But if you don't care about that - go ahead and buy one! Where power leaves the vehicle and enters the dyne system. A critical junction point. The drive roller is also a major part of the total system inertia, the defining factor of repeatability and flexibility of the dyne system. Low Inertia Dyne Systems are able to see more detail, are more responsive to power changes and repeatable than high inertia systems. <12.7" ULTRA LOW INERTIA, Patented, Drive Roller with excellent traction. Uses 20" drive roller with HIGH INERTIA value. Uses an extremely heavy 18" drive roller with very HIGH INERTIA value - perhaps twice that of Superflow and 3x-4x that the EC997. This roller was designed for inertia testing and should not be used on an eddy current system. Excellent detail in power graphs, will actually show small areas of only 1 of 4 cylinders missing that high inertia systems bulldoze through. Allows creating of real world loads, quickly - like the load experienced at 60mph in top gear. 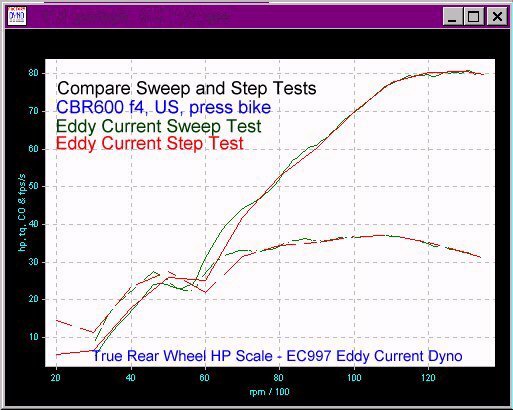 Click here for a view of a standard resolution view of a sweep test with very fine high rpm detail of a stock '99 CBR600F4 showing the carb tuning problem from 11.5k to redline. This indicates that power will be improved up to ~2-3hp at high rpm with CRB-H72-1.7-RK RaceKit Carb Recal Kit. Click here for F4 page with comparison of a step, sweep and comparison of both tests. High Inertia values prevent acquiring fine detail in sweep tests, making fine tuning detail unseen and unlikely to improve. Low Inertia systems eliminate this "power averaging" effect of high inertia systems. Extremely high inertia values in the Dynojet 200/250 causes greatly increased engine wear when step testing - the engine must be be sped up to each rpm, effectively doing a fully strained sweep test to each measured rpm point when step tests are done correctly. Low Inertia systems avoid this problem with less mass to move, showing more detail. Ultra Low inertia values allow very descriptive graphing - showing as low as one cylinder missing on a four cylinder engine. Controlled Load Tests OR Controlled Acceleration Tests are available. Higher Inertia values prevent acquiring fine detail in sweep tests, making fine tuning detail unseen and more difficult to improve and optimize. Extremely high inertia values in the Dynojet 200/250 Load Control dyno mask fine details and hide areas in the power band that could be improved. Additionally, the high inertia makes it more difficult make fine adjustments in braking force control when compared to a low inertia system. Patented drive roller, for all intents, eliminates uncontrolled slippage of the rear wheel, even when wet. With the patented drive roller, a minimal amount of downforce is required, often as little as bike weight only. Simple knurled drum on Superflow drive roller requires excess downforce for traction. According to users, traction is an issue with even 1100cc bikes. Simple knurled drum on dynojet requires excess downforce for traction. It's well known that traction, without high excess downforce is a major problem on dynojet dynos with worn rollers with even good 750cc supersport race bikes having problems with uncontrolled slippage. Australian users report that using VHT traction enhancer improves traction. Excess downforce causes tire deformation and heat buildup in step tests or extended sweep tests. Motorcycle Consumer News reports that they were unable to use the dynojet dyno to provide the proper HP figures on a lowly F4. The rear tire slipped at high power / high rpm on the new dj dyno. That's with a new, fresh knurled surface. Imagine how bad it would be if the knurling had a couple of years of use on it. But, if you don't really care, buy a dynojet dyno! Specially designed to NOT REQUIRE operator to sit on bike. Even if you chose to sit on the bike, it's only 12" off the ground. 6" to 8" lower and safer than other dynes. Stand or sit in chair to the right of the bike allowing access to the throttle, computer keyboard and mouse. Safer for tester and looks much more professional to consumer. Saves time for tester and narrows window of liability for dealership owner. Tester generally boards the bike, all the while balancing the remote control box while testing - exposing tester to possible injury from falling from straddling a bike on a narrow platform, 20" off the ground. Tester mounts bike while testing - exposing tester to possible injury from falling from straddling a bike on a narrow platform, 18" off the ground. Requires cumbersome remote mount monitor that impedes work on the bike while on the dyno, and an additional remote input to start and stop tests. Adding cost, complexity and the probability of damage to remote and cables during handling from dropping. Street tires, RR slicks (except "Daytona tires"), knobby tires are all OK to use. In fact, knobby tires have excellent traction on our drive roller. Factory Pro Software delivers extremely smooth data streams, producing smooth graphs on properly tuned vehicles. DRZ400, YZF426, KLX300, XR400, YZF400, KLR650, XR600/650 - all ok to test with original tires with knob damage being very uncommon. even if "everybody knows you can't test with knobbies"
It is recommended by users to change to street tires to test off road bikes with knobby tires - effectively cutting out that part of the retail tuning market. As related to customer by Dynojet (at Indy Trade Show 1999 from Paul Langley) Dynojet dynos cannot consistently record accurate data with knobby tires. Same tire problems as other large diameter drive rollers. Testing over the last 6 years of fan systems, we have evolved the best, most cost effective setup available. Our STD High Pressure Cooling System is individually switched and 110 vac. 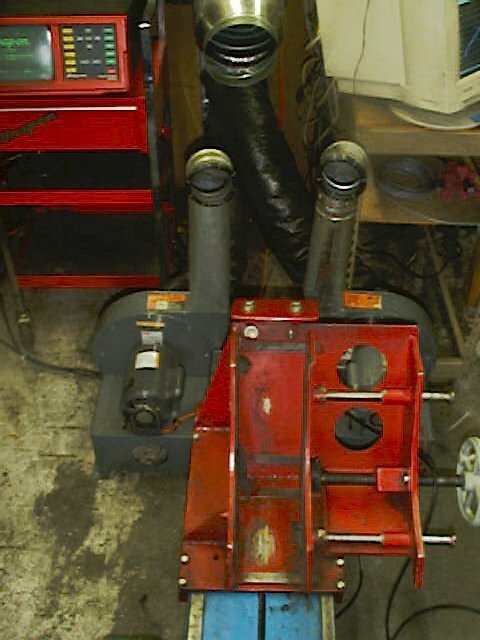 A low pressure, low velocity squirrel cage fan, mounted high on the front wheel chock is mounted to cool the engine and the exhaust system. Physical location of fan is poor, cutting visual path across dyno room and is a potential "head knocker" when adjusting wheelbase setting on dyno. Air output is weak as compared to other dynos, with only a 50mph velocity claimed. Our fan system is easily setup to pull cool, clean, outside air into the dyno room to cool the vehicle in the proper places and to assist in dyno room air transfer. Cooling air is drawn into the Superflow air cooled eddy current dyno chassis from inside the dyno room, where heat builds up, despite efforts to prevent it. 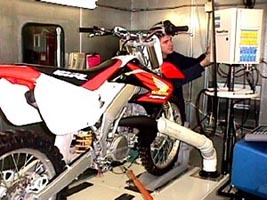 A well designed dyno room may not build up much heat as the test proceeds, but, with proper rooms having 10-30hp worth of air transfer equipment and air inlet ducting and diffusers, they are not your typical mc dealership setups. So, the fans are usually blowing a large quantity of preheated air at the bike to cool it. Cooling air is drawn into the fan inlet from the dyno room, preventing more efficient cooling that would be available if using cooler outside air. Same problem as Superflow, with far less air supplied and at a lower velocity. The Factory Pro STD High Pressure Cooling System is typically radiator height and requires a meager 16" square dyno room footprint each. Easy to maneuver, these high powered fans feature easy to direct, adjustable outlets to fine tune air direction for maximum cooling. Engines need air ducted to desired locations for cooling - air ducts don't cool if they don't point to the correct location. Power required in an air supply / delivery system is absolutely affected by ANY change in ducting. If the dyne system doesn't monitor and correct for power required by dyno roller powered integrated fans, any change in ducting will cause more error in the hp figures. Air flow direction is directable to a limited extent. Not applicable, not the intended use of the cooling system. Not an issue, air inlets are not integral to dyne chassis. Bury away! If you decided to negate the ~20" height issue by installing the dyne chassis into a pit, the air inlets will be below the surface of the floor, causing more intake restriction, and unless there is min. ~6" open area around the air inlet holes, you'll affect the vehicle power recording. The software would need to have the load change data and automatically adjust for increased intake restriction and the lessened fan loading will cause the vehicle hp figures to be increased by the amount of lessened load now produced by the fans. That would make your dyno read high. Good idea to install 18" high Dynojet dyno in a pit. Makes it easier to load. Air inlets are not an issue, as fans are not integral to dyne chassis base. Additional integral ducts for exhaust system cooling? As installed on Superflow, they blow hot air upwards, past some exhaust systems and towards the air intakes of many bikes. Most people don't actually measure actual air temp inside the airbox, they measure general air temp blowing towards the bike, so unless you measure airbox temps inside the airbox, the power readings will be incorrect. At any rate, repeatability is compromised, as tuning changes with air temp. 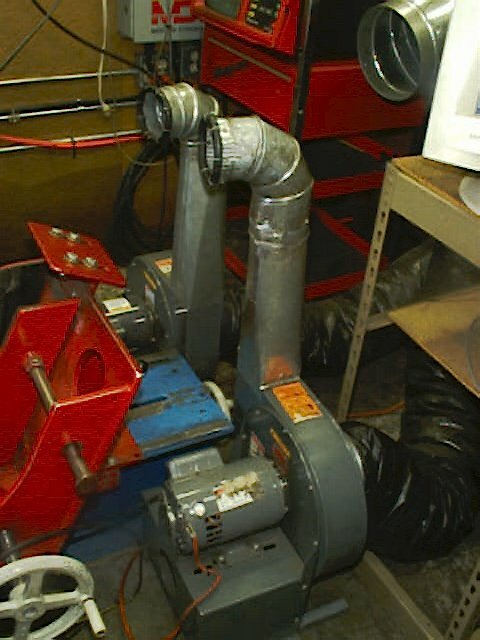 The permanently mounted squirrel cage fan, mounted high on the front wheel chock, has limited ability to direct air supply to cool exhaust systems. All measurements are automatically entered for you. Absolutely required to attain Factory Pro level accuracy. part of the DataComp Software Package.